Friendship offers opportunities for sharing, learning, fun, excitement, self-disclosure, support, advice and long-term relationships. For many children, making and keeping friends is quite effortless, but for some it is a challenge. Sadly, about one in ten school-age children have no friends and are disliked by most of their classmates. 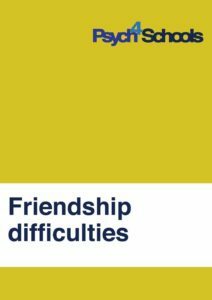 Asher, S.R., and Williams, G.A., (1996) Children without friends, Part 1: Their problems, research for the National Network for Child Care’s ...continue This ebooklet outlines some critical aspects of friendship, and strategies to support the child who has friendship difficulties. This ebooklet contains content that will raise your general awareness about assisting children and adolescents who have difficulty making and keeping friends. This will assist you to fine-tune and select appropriate strategies for individual children and specific situations. Strategies can also be easily adapted to be included in student’s Individual Learning Plans and the recommendations section of psychologist’s reports. The ebooklet Working with children with difficulty making friends is available free to download for all Psych4Schools members or for individual sale in our shop.